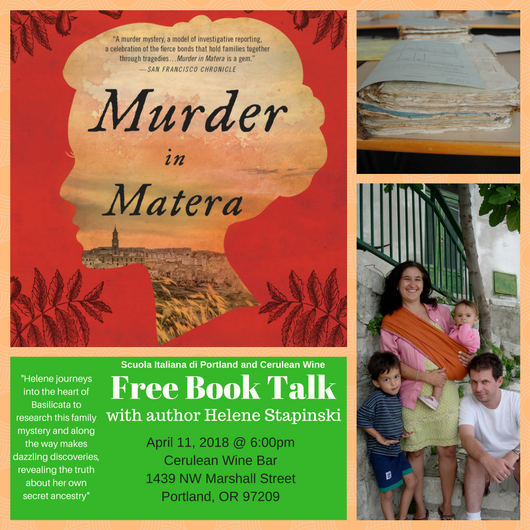 Please join us for a fascinating talk by author Helene Stapinski on her book, Murder in Matera, on Wednesday, April 11, 2018 at 6:00pm at Cerulean Wine Bar, 1439 NW Marshall Street, Portland, OR 97209. There will be books to purchase at the event or you can purchase one ahead of time here. It is not necessary to purchase a book to attend the talk. See below for a description of the book. Since the age of four, Helene Stapinski heard lurid yet inspiring tales from her Italian-American mother about her great-great-grandmother Vita, who emigrated from Southern Italy in 1892 with her three children after committing murder. In her new memoir, MURDER IN MATERA, Helene journeys into the heart of Basilicata to research this family mystery and along the way makes dazzling discoveries, revealing the truth about her own secret ancestry. Gripped by her familyâ€™s tale, Helene embarked on a decade-long fact-finding mission, making numerous trips to the rural â€œinstepâ€ of Italyâ€™s bootâ€”a breathtakingly beautiful land rife with superstitions and desperate poverty. Heleneâ€™s investigation soon becomes a journey of self-discovery. As her research progresses she comes to a stunning realization that shakes her own sense of identity, producing new branches on an undiscovered family tree., but also shedding light on the harsh conditions that made nine million Italians leave their homeland. While on her trips, Helene ate the same fruits her ancestors were hired to harvest for the wealthy land owners. It was through many meals with those who adopted Helene along the way that helped her understand her family fable. MURDER IN MATERA captures the rugged beauty and unusual traditions of an underexplored part of Italy, one that is on the verge of universal discovery as Matera is thrust into the spotlight as the European Capital of Culture for 2019. The region was recently featured on Anthony Bourdain’s Parts Unknown and has been heavily promoted by Francis Ford Coppola, whose family is from the same village as Helene’s family and who has opened a luxury hotel there. Deeply researched and reported, MURDER IN MATERA is a remarkable true story about one familyâ€™s hidden secrets. It is also a powerful story of immigration, place and motherhoodâ€”a profound testament to how far one woman would go to preserve her family.